Like his other soundtrack album, A Tribute to Jack Johnson, Miles music for Louis Malle’s film Ascenseur pour l’échafaud is often overlooked when considering the vast body of work that the trumpeter left behind, and it is only since his death that these two very different recordings have been re-examined and given credence in his musical development of the time. Recorded after Miles Ahead but before Porgy & Bess, Milestones and Kind Of Blue it is perhaps inevitable that music that was recorded for a somewhat second rate film would be sidelined or ignored by Davis’ new label Columbia when the trumpeter was in the throes of one of the most creative periods of this career. As a consequence, Ascenseur pour l’échafaud was originally released as a 10” LP on the small French label Fontana and only released in France. It would be some years later that the music would be released in the States on the by now standard 12” LP format that included the film music along with three tracks recorded by Columbia with Davis’ septet with Adderley, Coltrane, Evans, Chambers and Cobb recorded in 1958 and released under the title Jazz Track, and are included as bonus tracks on this disc. Listening to this music retrospectively, and with familiarity with the four classic albums mentioned above, it is now perhaps easier to hear how this music fits into Davis’ music of the time. 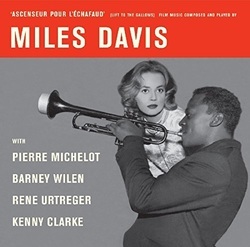 Miles had not made a small group album for sometime, and working with a new quintet during his sojourn in France gave him time to reflect on the direction he would take his own music. We are led to believe that for the recording of Ascenseur pour l’échafaud Miles simply entered the studio and improvised the music whilst watching scenes from the film. Careful listening would suggest that there were some concrete plans laid down for the music that the trumpeter wanted to lay down and if a greater emphasis on improvising on new structures was part of the process, this surely were the seeds that would bear fruit in the modal playing on Milestones and finding their ultimate form on Kind Of Blue. The quintet operate at the highest level of creativity given the circumstances and remit given, and it is know acknowledged that Barney Wilen deserves greater recognition for his contributions, soloing melodically and with great invention. His duet improvisation with Miles on ‘Au bar du petit bac’ is perhaps the highlight of the set. Miles is Miles and plays superbly, from his brooding and moody open trumpet sound on ‘Générique’ to the use of the Harmon mute to create tension with a bottled up and claustrophobic sound that adds an intensity to some of the films more dramatic scenes, as heard with his furiously contained solo on ‘Sur l’autoroute’. The bonus tracks, as indicated have all been released elsewhere, and indeed can be heard on another DreamCovers release 1958 Miles, and the tracks featuring Sonny Rollins on the Collectors Items album, both readily available. This however should not detract from the soundtrack music that should be heard and re-examined by Miles enthusiasts everywhere.